A green fuel that could heat homes and power cars and factories has been created – out of the sea. Scientists have developed a device that turns saltwater into energy – offering hope of combating global warming. Hydrogen is the most abundant element in the universe. It has huge promise for clean energy as it only leaves behind water. But producing it artificially has so far been costly and difficult – relying on highly purified water which is a precious resource in the drugs industry. Prof Dai, a chemist at Stanford University in California, said hydrogen is an appealing option for fuel because it doesn’t emit carbon dioxide. Burning the gas should ease worsening climate change problems. It could also address potential oil shortages. In terms of transferring the technology “one could just use these elements in existing electrolyser systems and that could be pretty quick,” said Prof Dai. Splitting water into hydrogen and oxygen with electricity – called electrolysis – is a simple and old idea. A power source connects to two electrodes placed in water. When power turns on, hydrogen gas bubbles out of the negative end – called the cathode. Breathable oxygen emerges at the positive end – or anode. But negatively charged chloride in seawater salt can corrode the positive end – limiting the system’s lifespan. Prof Dai and colleagues wanted to find a way to stop those seawater components from breaking down the submerged anodes. The researchers did this by coating the anode with layers that were rich in negative charges. They layered nickel-iron hydroxide on top of nickel sulfide, which covers a nickel foam core. The foam acts as a conductor – transporting electricity from the power source. The nickel-iron hydroxide sparks the electrolysis – separating water into oxygen and hydrogen. During electrolysis, the nickel sulfide evolves into a negatively charged layer that protects the anode. Just as the negative ends of two magnets push against one another, the negatively charged layer repels chloride and prevents it from reaching the core metal. Without the negatively charged coating the anode only works for around 12 hours in seawater. Co-lead author Michael Kenney, a graduate student in Prof Dai’s lab, said: “The whole electrode falls apart into a crumble. Previous studies attempting to split seawater for hydrogen fuel had run low amounts of electric current as corrosion occurs at higher levels. But the researchers were able to conduct up to 10 times more electricity through their multi-layer device, which helps it generate hydrogen from seawater at a faster rate. Without the risk of corrosion from salts the device matched current technologies that use purified water. 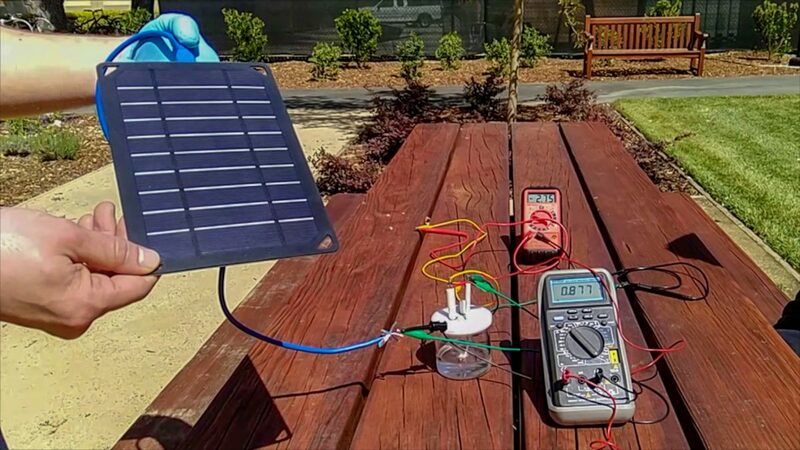 The basic recipe is surprisingly simple and will open doors for increasing the availability of hydrogen fuel powered by solar or wind energy, said the researchers. In the future it could be used for purposes beyond generating energy. Since the process also produces breathable oxygen, divers or submarines could bring devices into the ocean and generate oxygen down below without having to surface for air. Scientists are increasingly looking to the sea for inspiration. Earlier this year a Scottish team showed ocean waves can be converted into clean and consistent energy. They demonstrated the system in sea-simulating experiments at Edinburgh University’s spectacular £9.5 million water tank – the first of its kind in the world.